I am thinking of this small gem today as I keep the wood stove burning and the thermometer doesn’t get out of the single digits. 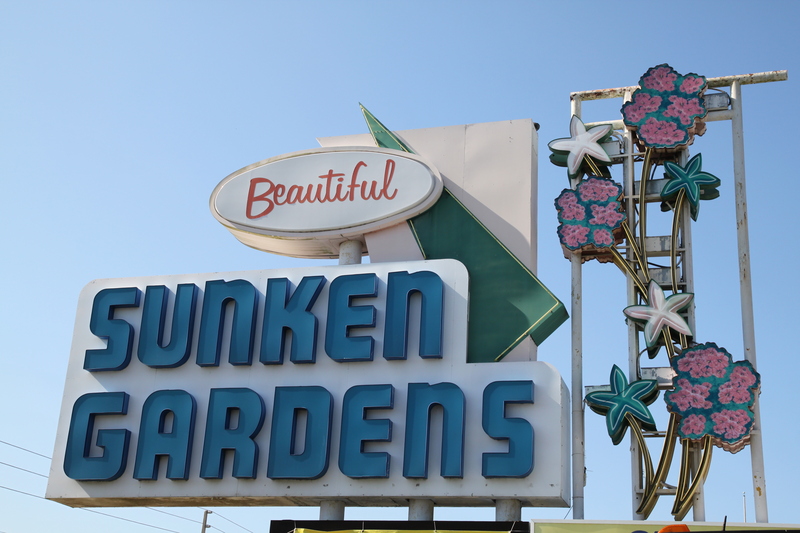 Sunken Gardens has been around since 1935 when George Turner Sr. opened his 6 acre property to the public to show off his walled gardens for $0.25 a person. Starting out as a place with a sink hole and a shallow lake, Mr. Turner turned this land into a rich area to grow fruits and vegetable by installing a tile drainage system. He was a plumber by vocation and horticulturist by avocation, Turner’s gardening transitioned from the fruits and vegetables he sold at his road-side stand to exotic flowers and tropical plants. Turner maintained the gardens, eventually leaving them open year round and amassing a flock of flamingos numbering in the hundreds. Turner’s sons purchased the property from their father and the garden became world famous. Celebrities visited and beauty contests were held there. The gardens went through many changes, a large gift shop (at one time the largest in the world), walk-through aviary, religious exhibits. Due to the construction of a nearby interstate and the creation of large theme parks, this garden, like many others, experienced a decline in audience and an increase in operational expenses that led a discussion concerning closing the gardens. The City of St. Petersburg now owns the attraction. Since 1999 the Parks Department has been operating and maintaing this oasis with great help from an army of volunteers. Right behind this sign is a strip mall and bustling 4th Street. You must enter, and leave (of course) through the gift shop. Modest, I’m sure, compared to the mega-shop of its past, this shop featured locally made and horticulture themed gifts for all ages and budgets. When you park in the lot, you have no idea what’s in store for you. 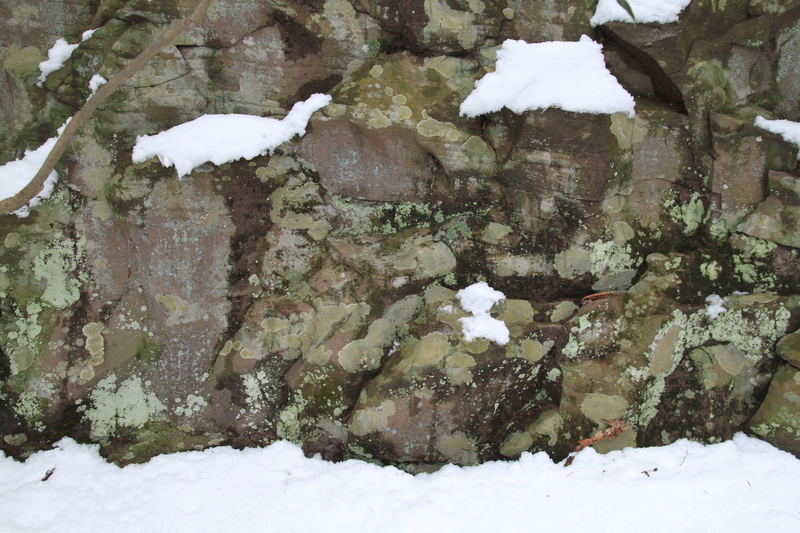 The garden is walled, and even at my height, I couldn’t sneak a peak to see what was inside. Categories: Road Trip! 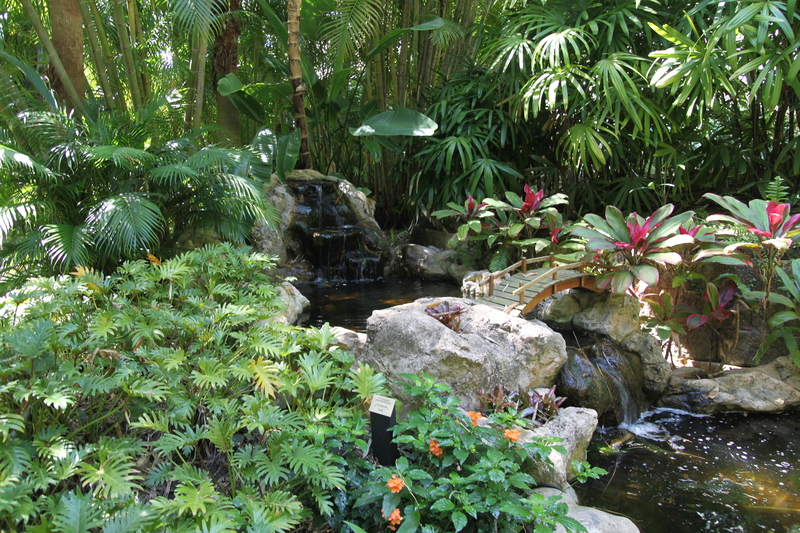 | Tags: Botanical Gardens, Florida, Public Gardens, public service announcement, Road Trip!, Roadside attractions, St. Petersburg, Sunken Gardens | Permalink. Road trip! I love a good road trip, and even not good road trips are fun. I am a “it’s the journey, not the destination” type of person, so no matter how terrific the final destination may be, I look forward with equal anticipation to the adventure of just getting there (and back!). And while my philosophy even extends to plane travel (I try to watch the happenings like watching a documentary on TV, trying to learn something from the experience, or at the very least amuse myself.) I really, really enjoy a good old, fashioned road trip. A snacks on the passenger seat, kayak on the roof, taking GPS directions only as suggestions, radio up loud, windows down, let’s see where I wind up road trip. This road trip I am heading down to the west coast of Florida. I have to admit, Florida isn’t one of my favorite states. Not enough snow or fall color for my liking. But it turns out my parents love it there and have recently decided to call it home. They live on the water now and I love to paddle, so I threw my boat on the car, packed up too much stuff, and hit the road. Spring was just starting to show its face when I was leaving. As I headed south, spring progressed as my miles increased. Soon I was seeing Bradford Pears (Pyrus calleryana) in full bloom. Everywhere. EVERYWHERE. Categories: Foreign Plants in Local Nature, Plants on the Move, Road Trip! | Tags: Bradford Pear, Florida, invasive, Mangrove, native plants, public service announcement, Pyrus calleryana, Rest Stop worth stopping for, spring | Permalink.